THE STORY - Caesar (Andy Serkis) and his apes are forced into a deadly conflict with an army of humans led by a ruthless colonel (Woody Harrelson). After the apes suffer unimaginable losses, Caesar wrestles with his darker instincts and begins his own mythic quest to avenge his kind. As the journey finally brings them face to face, Caesar and the colonel are pitted against each other in an epic battle that will determine the fate of both of their species and the future of the planet. THE GOOD - Andy Serkis is incredible as always. Matt Reeves focuses on the personal and the intimacy of this story with closeups and performance capture that will blow your mind. A terrific mixture of the very best and worst of humanity. THE BAD - Michael Giacchino's score, while excellent on its own, does not fully blend well enough with the images on screen for maximum effect. ​"War For The Planet Of The Apes" is the third and final installment in the rebooted "Planet Of The Apes" trilogy from Twentieth Century Fox, following the release of "Rise Of The Planet Of The Apes" in 2011 and "Dawn Of The Planet Of The Apes" in 2014. "War For The Planet Of The Apes" is officially the best film in the trilogy, bringing a dramatic and thrilling close to the story of the ape leader known as Ceasar brought once again to life by the multi-talented Andy Serkis. It's a staggering piece of visual effects work but writer/director Matt Reeves (Who also wrote and directed "Dawn") does not skip out on the emotional and personal beats of the story, thus making "War" possibly the best blockbuster film of the summer. Two years following the events of "Dawn Of The Planet Of The Apes," Caesar (Andy Serkis) and his apes are still feeling the after-effects of what the now deceased evil ape Koba started. The human forces have regrouped and are being led by a ruthless military colonel (Woody Harrelson) who will stop at nothing to save mankind. 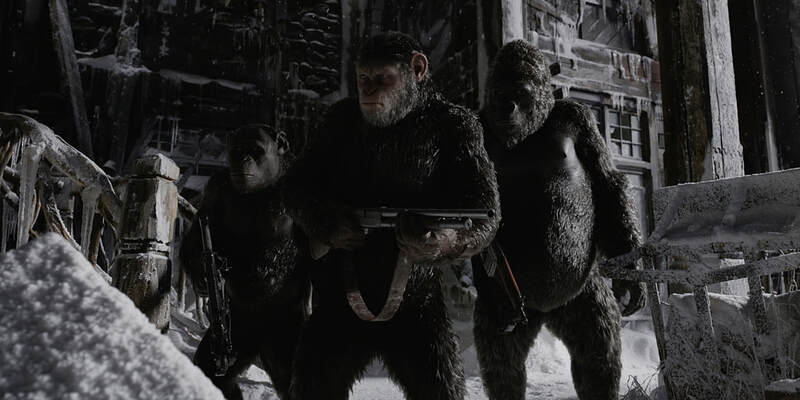 After suffering a personal loss, Ceasar goes on a suicide mission with a small band of Apes to track down the colonel and kill him, with the fate of both of their species hanging in the balance. The first thing that must be said about "War For The Planet Of The Apes" is the work done here by Andy Serkis once again is simply phenomenal. "War" is the first film in the trilogy to be seen entirely through his eyes without a human counterpart and the technology and Serkis himself rise to the occasion. Ceasar is one of the best-crafted characters I have personally ever seen in my entire lifetime of cinema not just from a technical level but also due to the performance that Serkis puts into it. The way in which Matt Reeves utilizes close-ups to hammer home the dramatic effect of this film is simply brilliant and the fact that the visual effects technology can hold up under such scrutiny is also a miracle. Serkis brings the character to unexpected depths in the final film of this trilogy and if there was any justice in this world, he would be nominated for Best Leading Actor at the Oscars. Woody Harrelson also gives a terrifying performance as the ruthless Colonel who has sacrificed his humanity in an effort to continue the human race and outrun extinction. His character is given a backstory that is not only horrifying but also makes dramatic sense for why he is the way he is. Matt Reeves provides Harrelson with enough material that creates for a fascinating contrast between him and Ceasar. Both want to protect their people but both have entirely different means in which how they want to accomplish this. One other person I'll draw a specific mention for is Steve Zahn who, like Serkis, plays an ape entirely in motion capture CGI known as "Bad Ape." While he may be the comic relief in a film that is excessively dark, Reeves wisely makes the jokes and Zahn's body language work well as a reprieve from the constant bleakness that is "War." Though there are comedic and beautiful moments sprinkled throughout "War For The Planet Of The Apes," this is an exceedingly bleak film. If you are an animal lover in any way, I'm not too sure how you will be able to handle some of the brutal violence within this film. It brought tears to my eyes on more than one occasion and it was not hard to see how this film could have gotten an R rating if it were pushed any further. One piece of frustration I have though (And I understand I am going to be in the minority on this) is the use of Michael Giacchino's score. While it's quite good as a standalone score, there were times where I felt it struck a tonally unbalanced chord and did not blend well enough with the images on the screen. Had the score taken a different route at times, it's possible that even more emotion could have been wrangled from the devastating and beautiful images taking place on screen. "War For The Planet Of The Apes" is quite possibly the best blockbuster film of the summer. Seen entirely through the eyes of Ceasar, the "war" in this film is not a great battle between all of the apes and humans but instead is an internal and deeply personal one for the Ape we have grown to love over the course of three films. Reeves wisely decides to keep the focus on Ceasar and not so much the grand conflict that is slowly wiping away the human species from this planet. The result is a film that Woody Harrelson's character, at one point as seen in the trailer and in the film, describes as being "So emotional." Who would have thought that what Rupert Wyatt (With "Rise") and Matt Reeves with "Dawn" and now "War" would achieve would be one of the most consistent trilogies in cinema history? All Hail!